The performance package hyperMILL MAXX Machining offers three modules for finishing, roughing and drilling that make it possible to achieve impressive boosts in productivity. HEGGEMANN AG, headquartered in Büren, Germany, is a development and manufacturing partner of the aerospace and automotive industry. The company uses hyperMILL to reduce machining times by up to one third on a range of workpieces. HEGGEMANN AG is also state of the art in terms of the software the company uses. The manufacturing management department makes use of a manufacturing execution system (MES) that complies with the latest Industry 4.0 standards. A product data management (PDM) system manages customer data as well as proprietary 2D and 3D CAD data. Once final approval is given by the customer, programmers can access the final data record and generate the required NC programs via CAM. 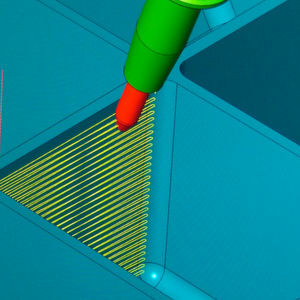 HEGGEMANN has used the hyperMILL CAM system from OPEN MIND since 2009. It particularly stands out thanks to the innovative hyperMILL MAXX Machining performance package. The ‘5axis tangent plane machining’ strategy in particular has left a lasting impression at HEGGEMANN, as it offers enormous potential for savings, confirms René Reiffer, Head of Production at HEGGEMANN AG. A major component of the innovative finishing strategy is the tool it employs – a conical barrel cutter specially developed by OPEN MIND for this purpose. Its geometry has a large radius of 1,000 millimetres or more, allowing enormous line increments during finishing. “We regularly achieve time reductions of 70 to 90 per cent in test workpieces compared with the use of traditional ball mills,” adds Dirk Lehmann. The time saving is primarily due to the barrel cutter’s enormous line increments measuring 4 mm during the final finishing pass. With a ball mill, it would be more than ten times the number of lines at a distance of 0.35 mm. Reiffer’s team saves additional time when it comes to programming. It takes about 20 minutes to create a finishing programme for a pocket like this with a ball mill. It is possible to program machining jobs for the 5axis tangent plane machining in five minutes. The new OPEN MIND performance package also offers other interesting high-performance cutting (HPC) strategies for roughing. For example, the hyperMILL MAXX Machining roughing module allows the user to achieve a maximum stock removal rate by intelligently separating spiral and trochoidal-like tool paths and dynamically adjusting the feed rate to suit the prevailing cutting conditions. HEGGEMANN also places great value on its excellent cooperation with OPEN MIND. “We receive a top quality service. When we have a question, we get a prompt response by e-mail or by phone. And if it’s really urgent, they’ll send over an application engineer to solve problems directly on site,” says Rene Reiffer. HEGGEMANN AG, based in Büren, is a service provider in the metalworking sector specialising in lightweight construction materials. The company was founded in 1962 by Paul Heggemann, with his son Robert Heggemann taking over the business in 1988. HEGGEMANN currently employs around 220 people, including 19 trainees. Although most of the company’s customers are in the aerospace and automotive industry, HEGGEMANN is not only involved in machining. It also assumes responsibility for all tasks centred around the product, from development right through to manufacturing. As a result, HEGGEMANN is on hand for customers as a partner throughout the entire supply chain and particularly stands out thanks to its strong development department: ‘360° from Engineering to Production’.